As mentioned earlier, I will be reviewing quite a few movies about young people for the next few months and and it was inevitable that I’d hit a stretch of “Senior Year” movies. The next four I plan to review are all set in that final year of high school, when there are decisions to be made about the future, one’s high social legacy, and completing whatever adolescent tasks remain before heading off to young adulthood. It is a dramatic year with a built in “ticking clock,” which should make for naturally compelling screenplays. Rick Famuyiwa’s Dope is one of the better ones in the genre, unique in that it offers a “triumph of the nerd” story that isn’t solely about its protagonist’s desire to get laid or become more popular. Instead, it is about something more challenging: developing the deeper insight into one’s identity necessary to have a voice. 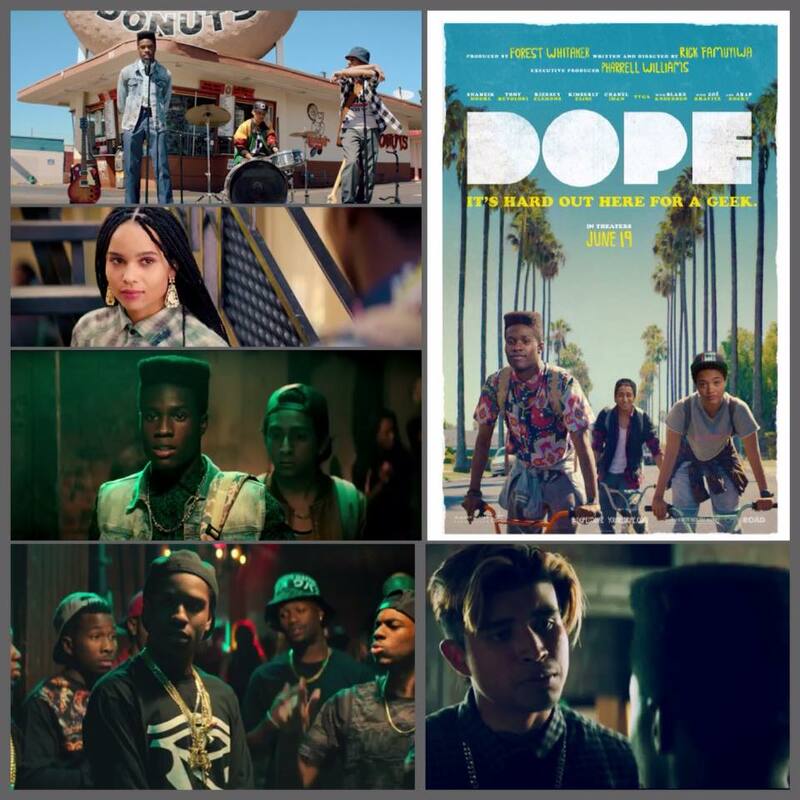 Dope tells the story of a month in the life of Malcolm (Shameik Moore) as he prepares to apply to Harvard university. He attends public high school in Crenshaw, a poor neighborhood in Inglewood, California, also known as “The Bottoms.” It is a neighborhood where gang warfare and the dangers drug dealing is a part of life. When the movie opens, Malcolm and his two best friends, a lesbian named “Diggy’ (Kiersey Clemons), and a kid of ambiguous racial make-up named “Jib” (Tony Revolori) are at the bottom of the school social food chain: they care about school. As the resident nerds are harassed consistently by their fellow classmates. They have spent their lives to date waiting for the opportunity to get out of their neighborhood and into college, and are satisfied to remain social outcasts, and pursue a range of interests – 90s hip-hop, manga, skateboarding and punk rock – meant to keep them on the outs with their peers and that Malcolm admits are more aligned with the interests of suburban white kids than African American youth. They are specifically avoiding establishing “street cred”, or posturing to climb up the popularity ladder. They have formed a band called “Awreeoh,” wearing the “white on the inside and black on the outside” label with pride. Malcolm himself is shooting the moon. With his high GPA and numerous extra curricular activities and interests, he hopes to be able to enter Harvard. The problem is that even though he is a good student, he does not have the connections necessary to have an easy entry. As his guidance counselor (Bruce Beatty) warns him, grades from a place rated as lowly Inglewood High won’t count for much and he will need to impress the admissions officers with his admissions interview and personal statement essay. Unfortunately, Malcolm doesn’t have a personal statement to make. Like many good students. While his desires have potential to become a good story, he lacks a voice necessary to impress others with its uniqueness. Instead of submitting a personal essay, he attempts to get by submitting a short theses on the history of hip hop, hoping that he will be judged worthy based on academic criteria. It’s a well reasoned paper, he argues, supported by evidence and original. Unfortunately, it says nothing about him. Only what he is interested in. Malcolm’s path sharply changes one day when he and his friends are blocked from their usual route home from school by a gathering of the Crips gang and decide to risk going down gang infested 104th street instead. On the way, Malcolm is knocked from his bike and starts a conversation with a drug dealer, Dom (Rakim Mayers), who takes a liking to Malcolm and asks for a small favor, which lands him an invitation to Dom’s birthday party that evening. He knows this turn could be trouble, but Jib and Diggy convince him to take the risk, especially since that party involves meeting up with Nakia (Zoë Kravitz), Dom’s former girlfriend who seems to have taken a liking to Malcolm. At the end of the night, Malcolm ends up with a few kilos of the drug “Molly” that threaten to drag him down the slippery slope into drug running. The rest of the film deals with his attempts to get rid of those packages while staying on schedule to complete his college application. Unlike so many others, can he get off the slippery slope once he is on it? Dope is a convoluted movie with a lot going on, and while the tone shifts between comedy and drama from time to time, those shifts are necessary to maintain interest in outcome. The stakes are high as Malcolm could end up caught by the police or worse, and those short dramatic turns prevent the movie from being completely predictable. Yes, given the opening tone of the movie, the success of the protagonist in meeting his goals should never be in doubt, but the path is never straightforward and there is enough drama to make us wonder if perhaps the outcome will be a tragic one, at least for some of the characters. Beyond the plot turns, what kept me interested is young Mr. Moore, who demonstrates a good flair for comedy and plays well off of the large number characters Malcolm encounters during the movie. There are too many characters to actually develop anyone except the lead, instead, each has their memorable quirk. Some may find that frustratingly shallow, but that approach works better in comedy. This is not a deep mediation on the psychology of youth and doesn’t pretend to be, although the movie does speak to the nerds with aspirations everywhere, even if the trials Malcolm faces may be specific to poor African American neighborhoods and urban public schools. Also noteworthy are the score that Germaine Franco has put together, with assistance from executive producer Pharrell (one of many producers), who apparently is responsible for making Awreeoh one of the more interesting fictional bands you’ve never heard of. This entry was posted in Comedy, USA and tagged 2015 movies, comedies, dope (movie), movie review, usa. Bookmark the permalink.